My third great grandparents John and Mary (Delano) Keller's tombstone is located in the Hedding M.E. 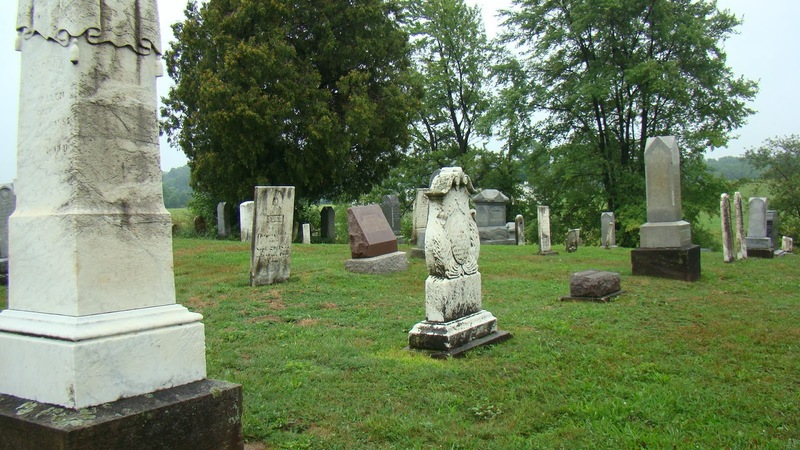 Cemetery in So. Bloomfield, Morrow Co., Ohio out of the view from the road. You have to enter the cemetery at the gate and walk over the knoll to the other side. A cousin had sent me a photo of the tombstone and I thought the tombstone was gigantic but it is about my size. In 2007 it was almost overwhelmed by a large rose bush, someone had tenderly planted years ago and it was now jeopardizing the stone. The bush was about to knock the tombstone over. I did not have tools to cut it back in 2007. The other problem was that the stone was being taken over by mold and the inscription was getting very difficult to read because of the softness of the stone. 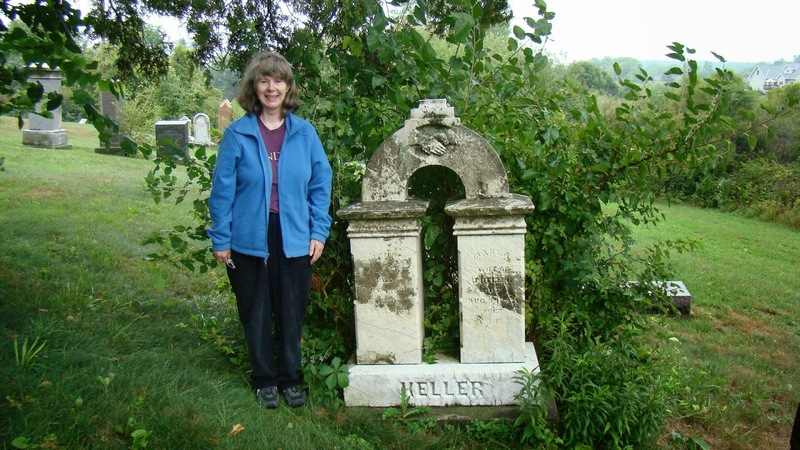 Here I am in 2007 with their tombstone and you can see the bush and the mold. When I saw the condition, I looked up the the South Bloomfield Township information on line and asked for help.The person I talked to was a man with the last name of Slack. He had no knowledge of his descendancy from this couple but apparently he did something and took action. I am grateful. In the photo below it is 2011 with me standing there beside it. You can see that the bush has been removed or cut way back yet still not dead. The mold is there but not as bad because the sun and light can access the stone for it is not shrouded in shade. The tombstone is right on the hillside which is steep. It is still standing but I am worried about its stability on that slope. UPDATE: Lavina Keller Helt's tombstone is to the left behind this large one. She is their daughter. A cousin explained to me the problem for the name was misspelled in the records. Peter's information was totally covered with mold back in 2007. It is on the left side of the tombstone. I brought clippers with me this time and did a little more pruning but I could see the bush has been chopped way back. Peter Keller in 2011 - the mold is much improved but the reading is difficult. Peter, d. May 22, 1863 - Aged 34 y 5 m 24d. To the east is another tombstone and this is another son of John and Mary Keller and Peter's baby brother William Frank Keller and his wife Ida C. This tombstone is so close to the east boundary line you can barely get in front to read it and the bushes shade it. Here is my attempt on a rainy day in 2007. There are two stones on each side of this large stone with Father and Mother inscribed on the top. 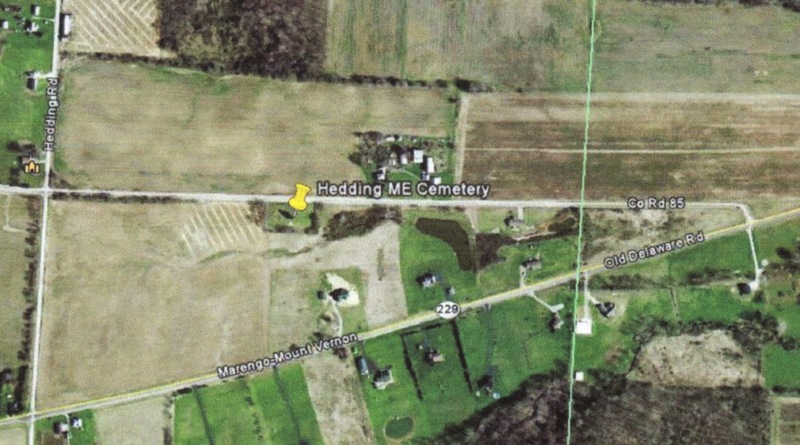 The Hedding M.E.Cemetery is very special to me. My third great grandparents are buried there. They are John Keller and Mary Anne Delano Keller. I had the good fortune to visit this cemetery twice. The first time in 2007 when I went to the FGS (Federation of Genealogical Society Conference) in Fort Wayne, Indiana. Ohio was only 2 hours away and I can do that in a car. So after the conference I headed east. This particular trip I did not blog about because I had not taken the plunge into blogging. The trip was from Fort Wayne to Kenton and then to Mount Vernon and then back to Fort Wayne to do a little more research at the Allen County Library in their brand new genealogical section. Hedding M.E. Cemetery was a little confusing to find back then so this next trip in 2011 I was going to nail it down and not end up asking a neighbor for directions. I was with a cousin the first trip so it helped to have another person to navigate and deal with the natives. The second trip I was on my own. This cemetery is not that far from the Green Valley Cemetery in which my other 3rd great grandparents are buried, John and Lydia Spracklin. John and Lydia's son Daniel married Elizabeth Keller the daughter of John and Mary Kelelr in 1852 and headed to Iowa. I refer you to my other blogs: Solomon Goss of Fearing Twp., in Ohio and The Barclay's of Pine River for more information on these families. See right side of this blog for links. Starting in Mount Vernon you head out on State Rte 229 (Old Delaware Rd) you can turn right onto Cochron Rd. and go north to the Green Valley Cemetery and along the way you pass by John and Lydia's land. To get to Hedding M.E. Cemetery keep going west on State Rte 229, past Durham Rd (Hwy 1), past Braddock and then it gets a little tricky because you come to a road that goes off to the right (CR-85) and you take that road and then you cross from Knox Co. to Morrow Co. and it is now CR-21 which is about .3888 miles to the cemetery. It is about 20-22 miles from Mount Vernon. Morrow County, Ohio - 2011 - LOVE IT! The road is a two lane narrow county road and you have to park your car carefully. Make sure you lock your doors because you will not be able to see it from the cemetery which requires you to climb up a little knoll. Here are some overview photographs taken in 2007. It was overcast, damp and misting that day. The following photographs where taken in 2011. You can see that it is sunny and bright. More photos from this cemetery to follow with a look at the Keller tombstones in more depth and other stones as well.